TORONTO, ON--(Marketwired - April 08, 2015) - Ross' Gold™, a division of Green and Hill Industries Inc. (OTC PINK: GHIL) (the "Company"), today announced that it will be launching its Ross' Gold™ Glass premium line of smoking products in Toronto during the 420 Rally on Monday, April 20th. Ross' Gold™ Glass is designed, produced and distributed by West Coast Gifts under an exclusive license granted by Ross' Gold™. 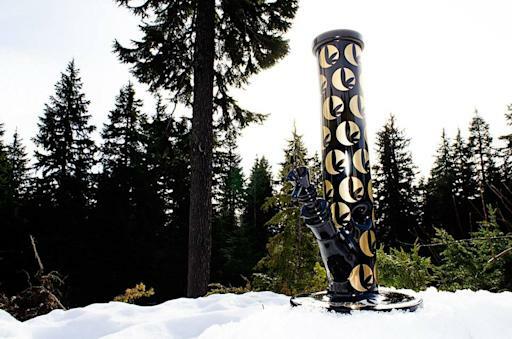 Ross Rebagliati, CEO of Green and Hill and the first Olympic Gold Medal Winner for Men's Snowboarding, commented, "I couldn't be happier to launch the Ross' Gold™ Glass products in Toronto in conjunction with the 420 Rally. What a perfect time and place to unveil this amazing new line of products and share in the festivities of Canada's largest pro-marijuana event! I'm very proud of the Ross' Gold™ Glass quality, style and unique packaging. Modern designs, heavy weight glass and luxurious details distinguish our glass products from others on the market. They're Good as Gold!" Ross's Gold™ Glass premium products include water pipes, bubblers, hand pipes, pipe parts & accessories, as well as a portable vaporizer. Ross' Gold™ Glass water pipes will include a certificate of authenticity signed by Ross Rebagliati, a Canadian Tube Toque™, and a collectible Ross' Gold emblem pin. The Company will issue a follow up release with specific dates and times that Ross' Rebagliati will be appearing in Toronto. Green and Hill Industries Inc. is the owner of Ross' Gold™ which plans to license it established brand through partnerships including government approved producers for medical cannabis strains called Ross' Platinum, Ross' Gold, Ross' Silver and Ross' Bronze with specific THC/CBD levels for specific ailments. The Company has an established international marquee with the celebrity of Olympic Gold Medal winner Ross Rebagliati who is a spokesperson for the benefits of medical cannabis, especially as it relates to sports training, injuries, pain management and stress. Ross' Gold is building its brand to be a premium hemp product line and medical cannabis label internationally. The Company is launching its line of Ross' Gold™ Glass retail products at the Toronto 420 Rally including glass smoking products, water pipes, bubblers, hand pipes, water pipe parts & accessories, and concentrate parts & accessories, as well as vaporizers through a licensing partnership. Ross' Gold will also be offering a wide variety of hemp products geared towards promoting a healthy lifestyle, the first now available in the USA. Ross Rebagliati has been recently featured and continues to be featured in the media on television and print including VICE, USA Today, High Times, NBC, CBC, CNN, Yahoo Sports, Die Welt, CTV, The Toronto Star, The Denver Times, Sports Illustrated, The Pique, Leafly.com, Whistler Question, NORML, Huffington Post, The Daily Telegraph, and more. The Company is under a pre-development contract with a major production company for a television series tentatively titled Ross' Gold. Please visit www.rossgold.com for more information. This news release contains "forward-looking statements" as that term is defined in Section 27(a) of the United States Securities Act of 1933, as amended and Section 21(e) of the Securities Exchange Act of 1934, as amended. Statements in this press release which are not purely historical are forward-looking statements and include any statements regarding beliefs, plans, expectations or intentions regarding the future. Such forward-looking statements include, among other things, projections of worldwide sales of Ross' Gold's products and global markets. Actual results could differ from those projected in any forward-looking statements due to numerous factors. Such factors include, among others, the inherent uncertainties associated with new projects and development stage companies. These forward-looking statements are made as of the date of this news release, and we assume no obligation to update the forward-looking statements, or to update the reasons why actual results could differ from those projected in the forward-looking statements. Although we believe that any beliefs, plans, expectations and intentions contained in this press release are reasonable, there can be no assurance that any such beliefs, plans, expectations or intentions will prove to be accurate. Investors should consult all of the information set forth herein and should also refer to the risk factors disclosure outlined at www.rossgold.com and other periodic reports filed from time-to-time. Green and Hill Industries Inc. is not a medical nor recreational marijuana/cannabis company, has not applied to Health Canada to become a licensed producer, nor does it have any plans to apply for a license under the Marihuana for Medical Purposes Regulations (MMPR). There can be no certainty that 'Licensed Producer' status may be awarded to any applicant by Health Canada including any applicant that Green and Hill Industries Inc. may have contracts with or be in negotiations with.